I’m making some colouring sheets to sell on BearsGetCrafty. I thought I start by sharing a few free samples. 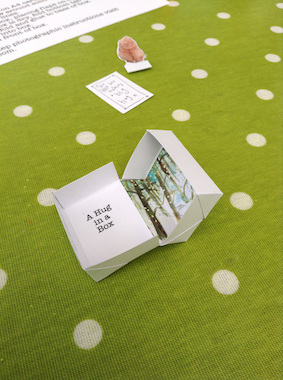 Click on the link next to each image to download and print the FREE PDF. I’d love your feedback on which you liked best and other types of images you’d like to colour. Please remember I retain the copyright of these images and you may not sell them in any form. Do print them out as many times as you like for personal use. You can also buy colouring sheets to download from my Etsy shop HERE. There are only a few at the moment, but I hope to add new ones regularly. Free to download. Click here for the PDF. 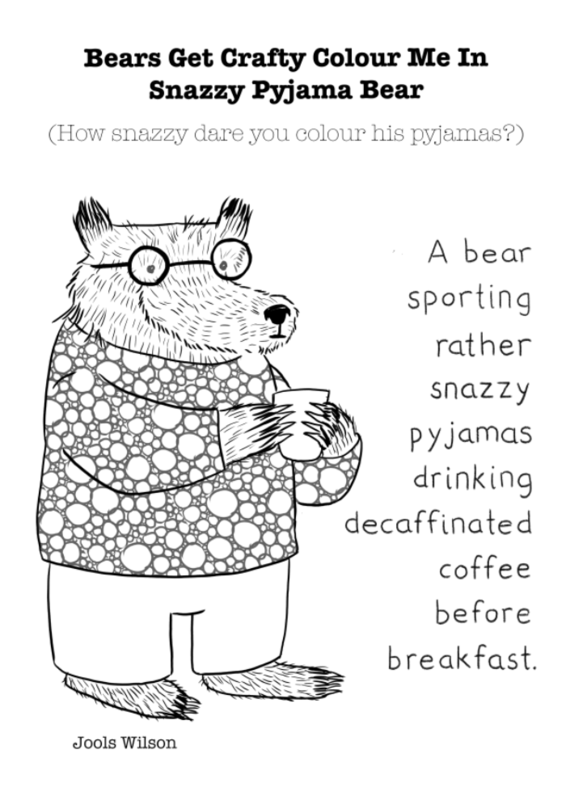 Colour in Bear: How Snazzily Dare You Colour His Pyjamas? Something for a wet long weekend. Happy Easter. Click here to download and print. Enjoyed the free colouring sheet? Check out the set of 5 funny postcards. Here. 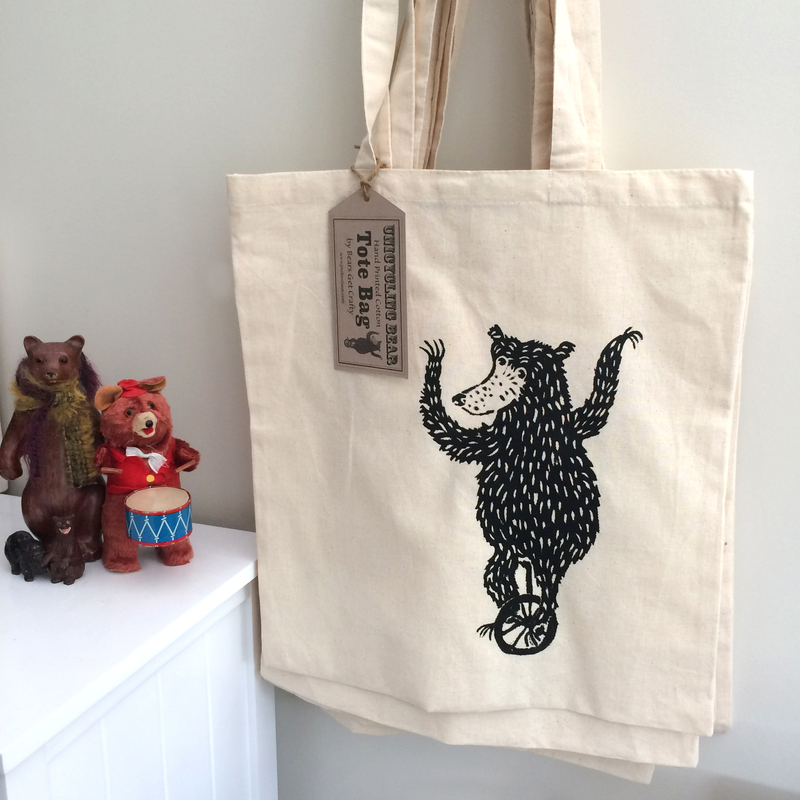 Print out and make this cute bear for free! For personal use only. Copyright property of Julie Wilson. For more cut out and make activities visit my shop http://www.bearsgetcrafty.com. 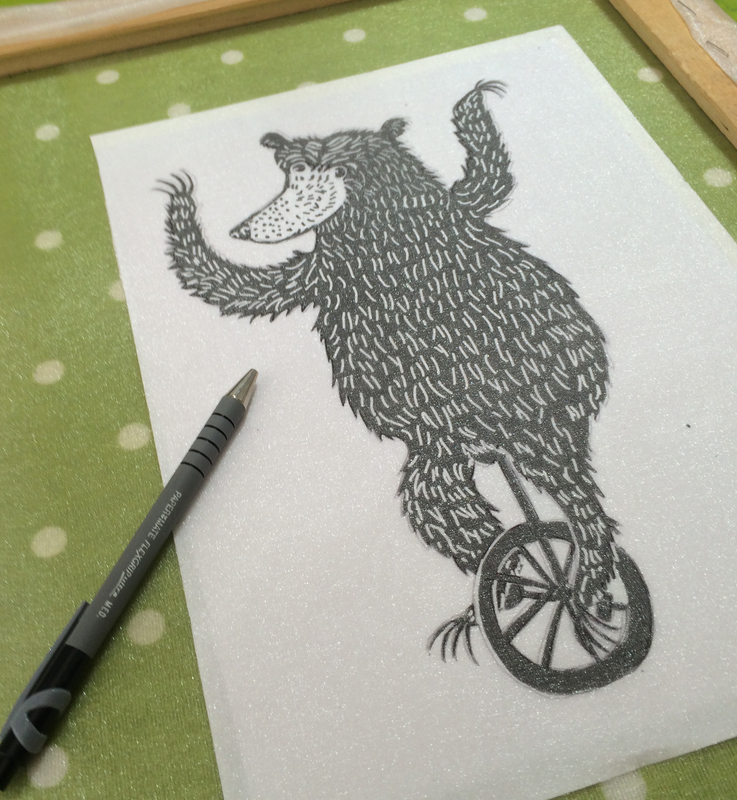 I love prints as an art form, but apart from some basic lino printing and screen printing I haven’t done any myself. 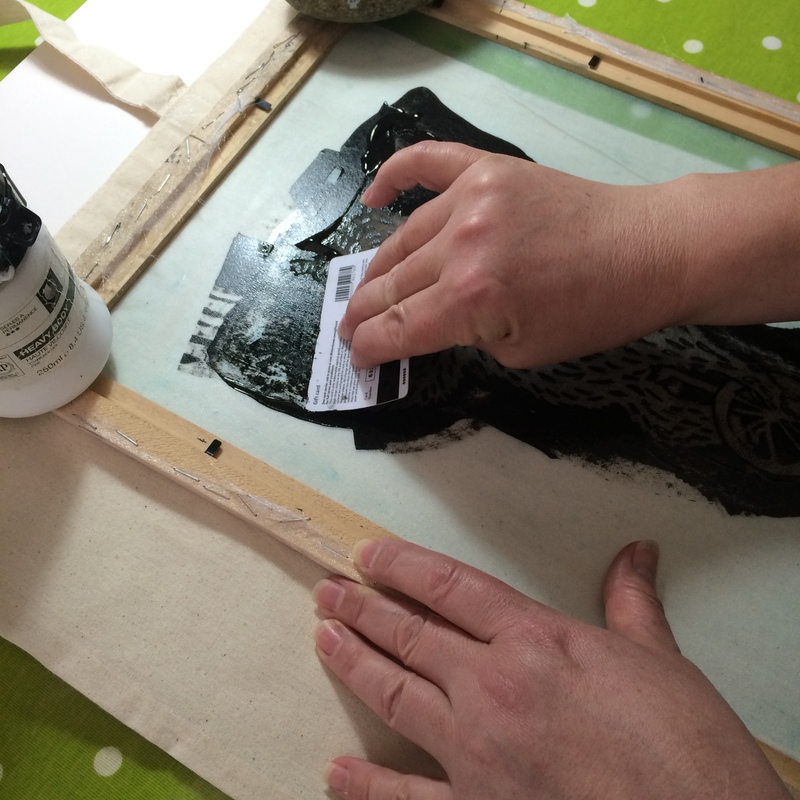 Print making seems a bit of a daunting thing to try, requiring expensive equipment and space. I’ve always particularly wanted to try dry point etching, so I got really excited when I saw an artist on Twitter talking about PRINTING AN ETCHING WITH A PASTA MACHINE! Gosh. Naturally I rushed out to buy one. Luckily my local cookshop had a modest one on sale and I got some sheets of flexible clear plastic from a nearby model shop. The plastic sheets I bought were A4, so I cut them up so that they were small enough to feed through the pasta machine. They don’t need to be clear, but it’s handy if you want to trace over a drawing. I scratched my design with a pointed implement I found in an old box of tools. I’ve no idea what it’s really for. Any pointed tool you can comfortably hold should work. I used block printing ink as it was available. It worked fine. I’m going to try printing with acrylic paint with a drying retardant mixed in. I found the best way to ink the design was to rub the ink into the scratches with a cloth, then rubbing of the excess with a dry cloth. I printed onto cartridge paper, as I had some. Soak it in water for a few minutes first and pat dry. 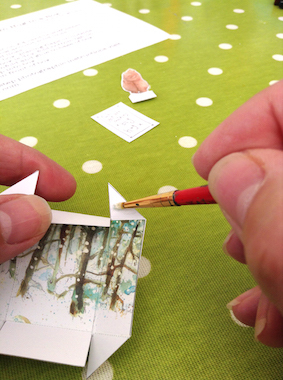 You’ll need to experiment with how wet the paper needs to be. Put the paper onto another piece of paper and some felt and place the inked plate face down on your paper. Fold the other side over. Be careful to hold the plate and paper together as you feed it into your pasta roller. Wind the handle! You’ll need to guide the bottom end so that it doesn’t catch on the bottom of the machine as it emerges. There are several demonstrations of this by artists on YouTube. Worth a visit. …using pen, coloured pencil and watercolour pencil. I thought they would make fun brooches..
I’m going to use the images for prints and cards and a few other things. The brooches are available on my Etsy shop, BearsGetCrafty. Also, as they I enjoyed colouring them in so much, I thought I’d share the fun… Click here to download the colouring sheet. Click here for the free PDF to download. 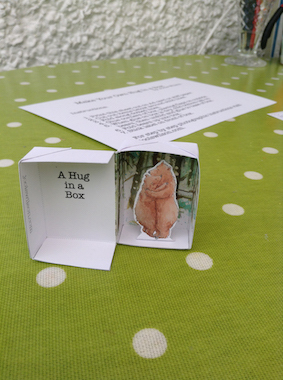 If you need help with how to make your Pug in a Box, visit my Hug in a Box page and follow the method there. Please share, make pugs, give them to people, take photos and show me. Copyright is the property of Julie Wilson. Download for personal use only. 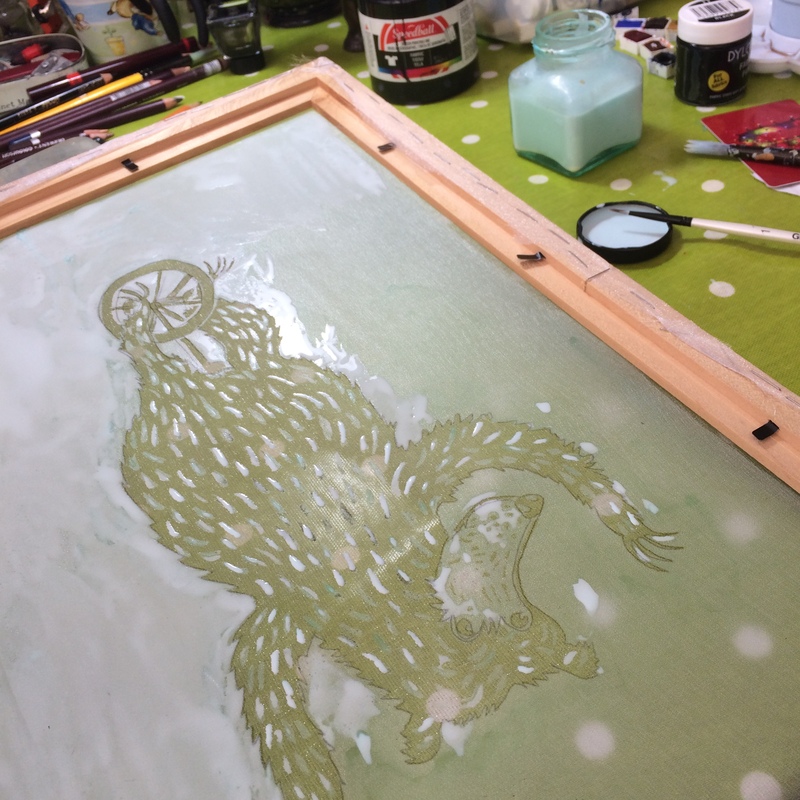 (How to) Screen Print a Bear! 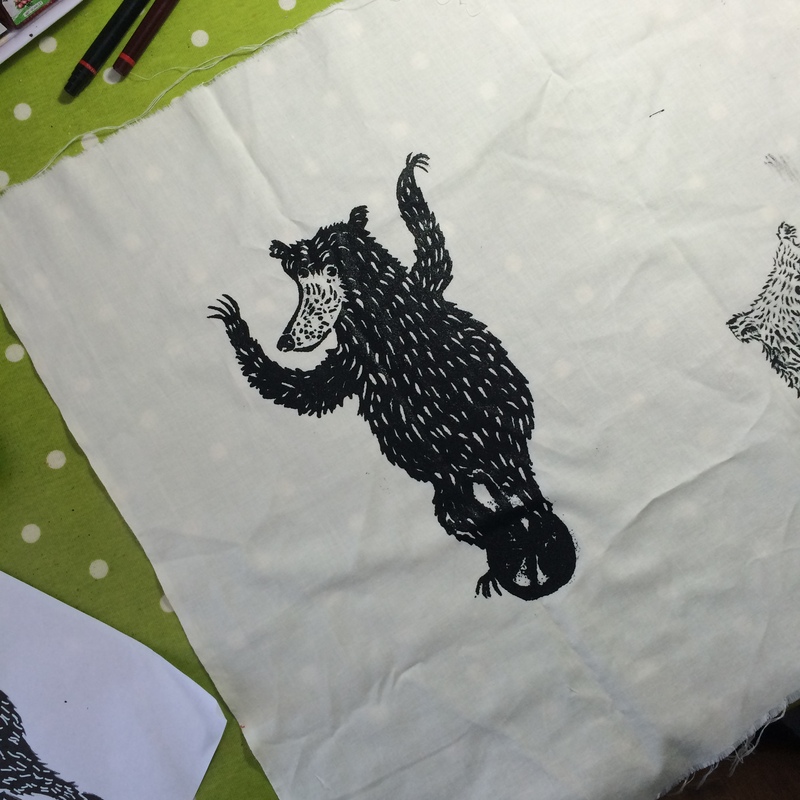 How to make a screen print on fabric with very cheap materials. 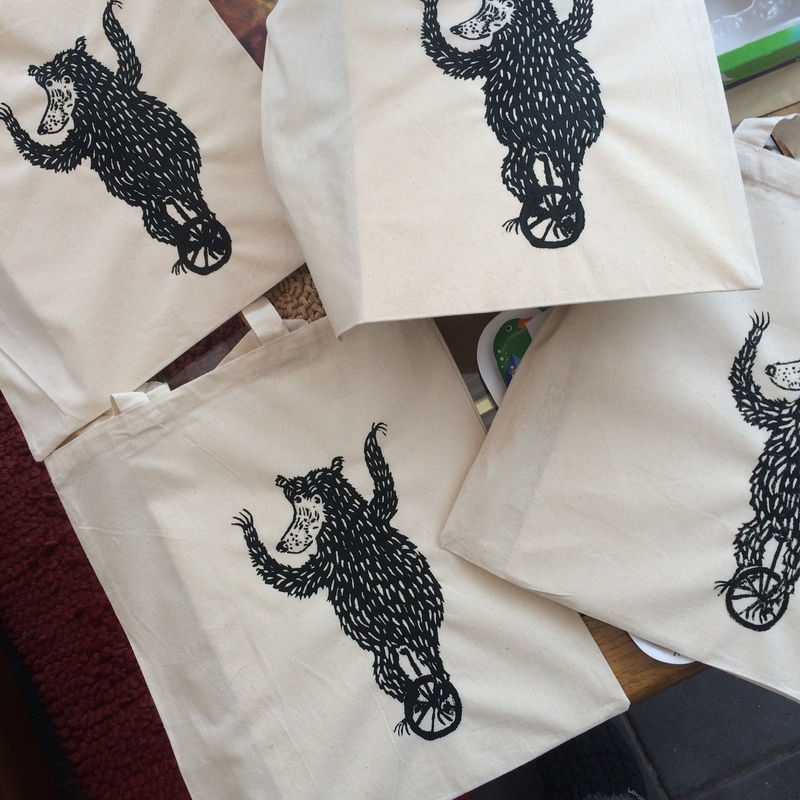 I’d been wanting to print tote bags to sell on my shop for a while. I looked at commercial printing but it was expensive and required having large quantities made, home screen printing with photograph emulsion sounded complicated and I rejected lino printing because I just hate cutting it. Luckily, I found several tutorials on the internet for different methods of screen printing. I experimented a little, and used various of the ideas I’d seen. This is how I did it. First you need your design. 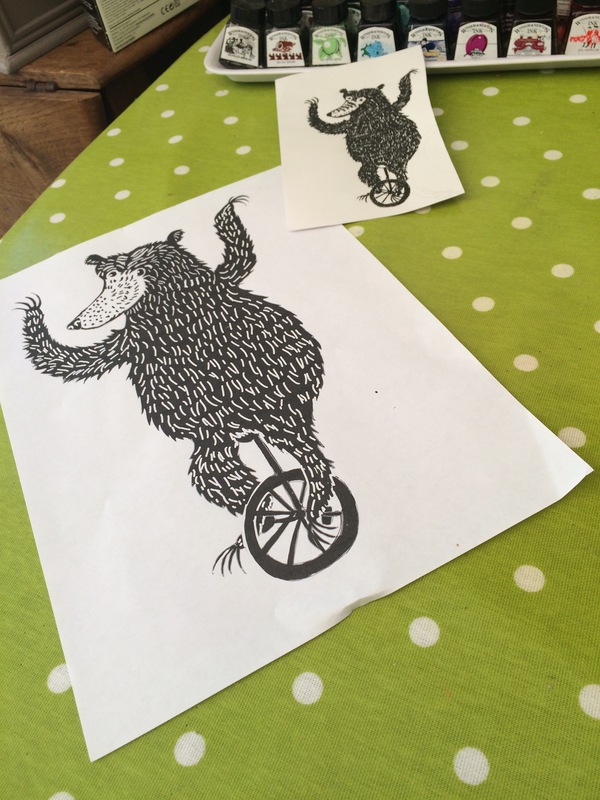 I drew my unicycling bear very roughly on paper then scanned it, completed the design in photoshop and printed it out the size I wanted it on the bags. You can just draw the design to the size you want or find an image on the web. Next I took my piece of voile and stapled it to my picture frame. It needs to be as taut as possible. Keep the staples to the back of the frame as it needs to sit perfectly flat on your fabric while you are printing. 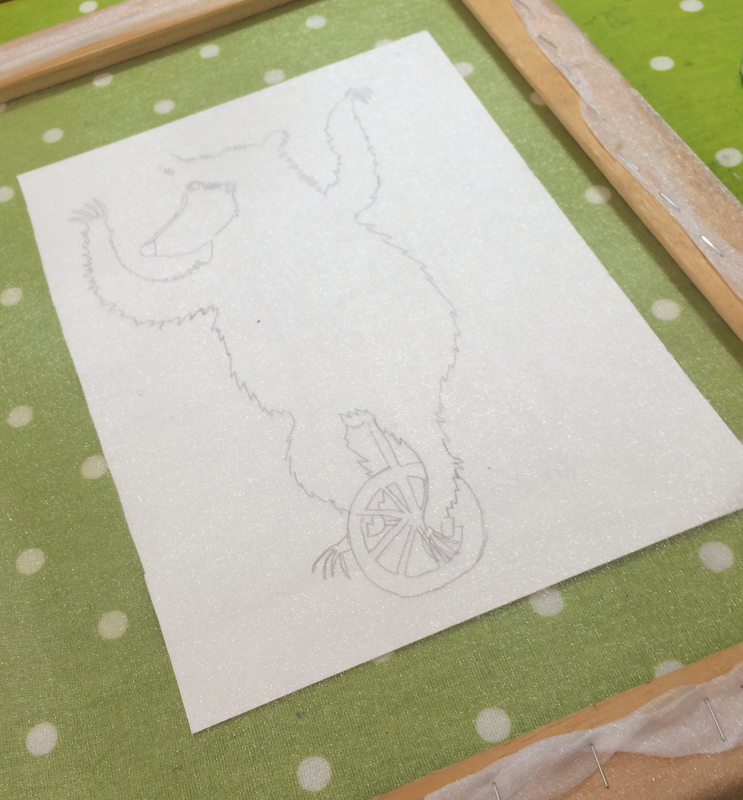 I put my printed out design under my frame and traced it onto the voile with a ballpoint pen. The next stage is to start painting on your screen with a blocking agent. I used a 50/50 mixture of PVA glue and water. Simply put glue and water into a jam jar and shake thoroughly! I also added a drop of acrylic ink to mine so that it was easier to see where I had painted. The idea is to block out all the areas you wish to remain white. 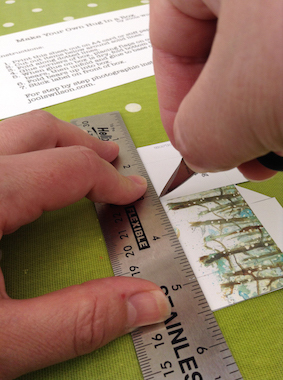 Prop up your frame so that it’s not touching anything underneath and start painting on the glue mix with a fine brush. 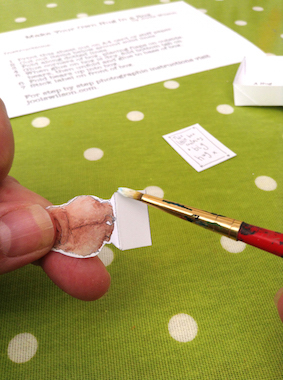 Once you have painted round the outline and added the detail use a larger brush to block in the big white areas. Allow the glue to dry and then repeat with a second coat. 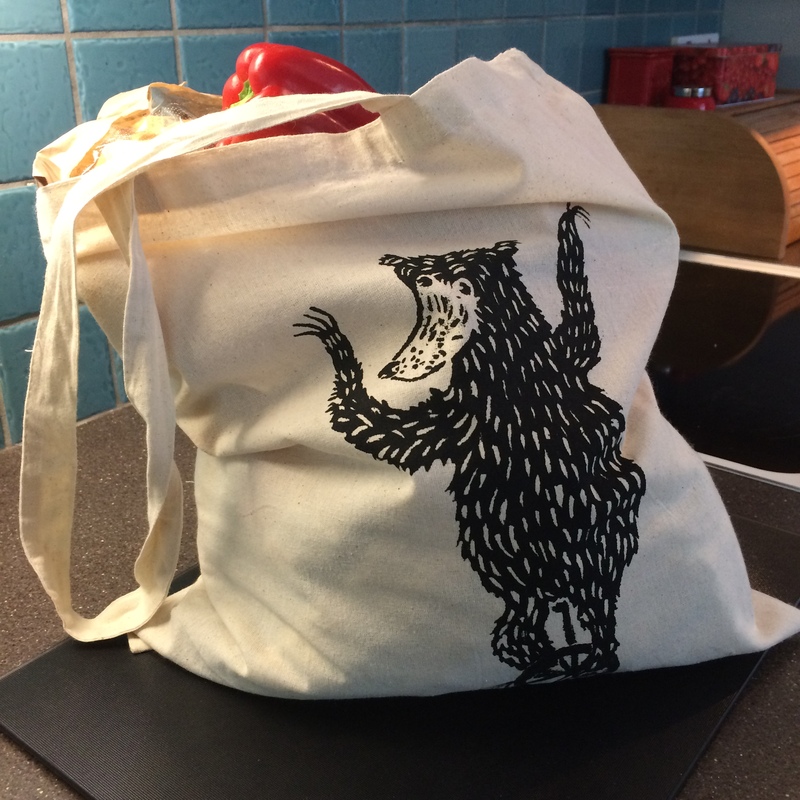 I made a test print before I started printing on bags. If you find you have made a mistake you can gently rinse off the ink under the cold tap, allow to dry, add more glue and dry before printing again. To print you will need to put something underneath your fabric. I have a vinyl tablecloth and I put a piece of mountboard inside the bags. A plastic bag should work fine, but whatever you use make sure it is flat and smooth. It’s also a good idea to iron your fabric before you print on it. Once you have covered your image with ink you can carefully lift your frame off. Put your fabric aside until the print has dried thoroughly. If you want to print another, carry straight on, or carefully rinse the ink off of your frame to use again. This sounds complicated but it was really fun to do! 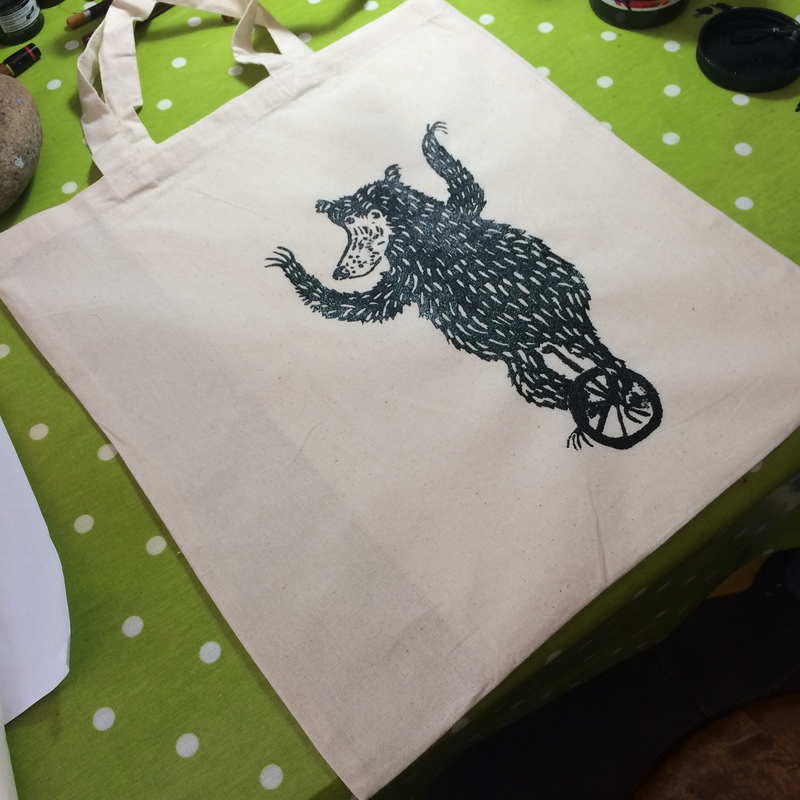 My Unicycling Bear tote bags are available to buy on my Etsy shop. 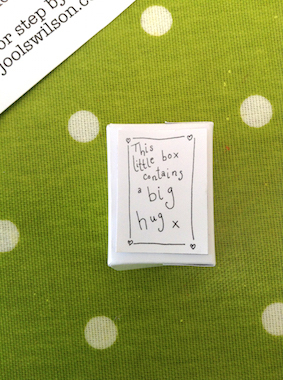 Download and make a hug in a box, then give it to someone who needs a hug. 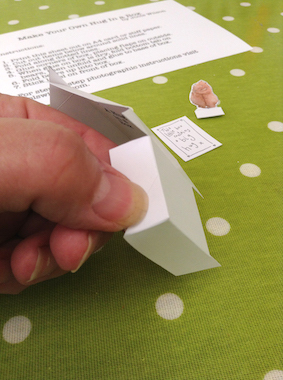 Print out the PDF file onto card or stiff paper. Cut out the 3 images at the bottom of the page. Carefully cut the tabs as far as the image. 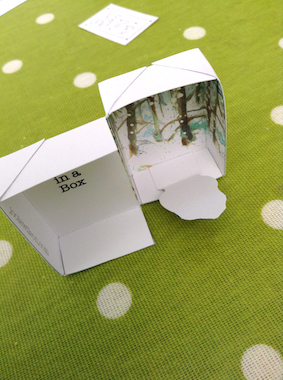 Fold the box along all the dotted lines. It will help if you gently score the fold lines first. 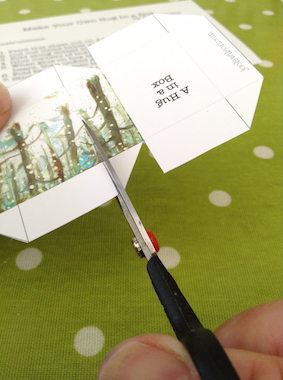 One at a time, apply glue sparingly to corner tabs and glue to outside of box. Hold each corner in place until dry. Score base foldline on bears and unfold again. Apply glue sparingly to base. 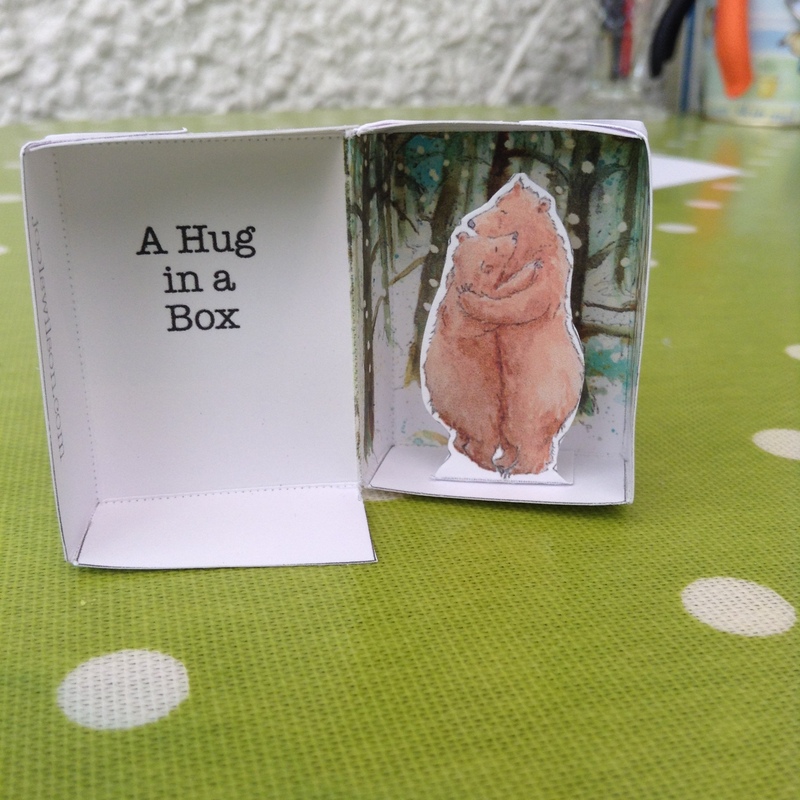 Stick bears into base of box pressing down firmly. Hold until dry. 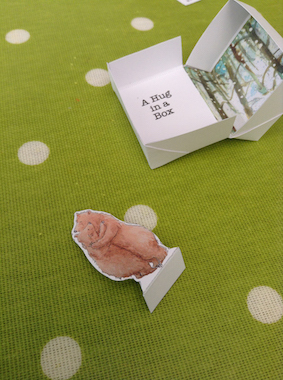 When the glue is dry, fold bears up into box. Stick the label on the front of the box. 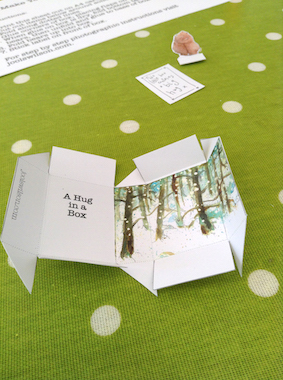 You’ve made a hug in a box! A ridiculous way of drawing..